by Amjad Iraqi, for Al-Shabaka Palestinian Policy Network. This commentary is part of Al-Shabaka’s Narrative and Discourse Policy Circle, convened in 2018, in which a team of Al-Shabaka policy analysts worked together across borders to tackle the question of whether Palestinians should have a sole, legitimate narrative and, if so, what it should be. 1 For more from this policy circle, see Hazem Jamjoum’s “Reclaiming the Political Dimension of the Palestinian Narrative” and the online Policy Lab discussion between Tamara Ben-Halim, Hazem Jamjoum, and Amjad Iraqi, “Palestinian Narrative: How Do We Build A Strategy? Narrative and discourse relate to the concepts we use in thinking and communicating about ourselves and the world around us. These concepts are usually articulated and promoted by political, social, and cultural institutions and movements; they reflect and shape power relations; and they impact people’s values, thoughts, beliefs, and ultimately actions. They are expressed through a wide range of forms, including literature, art, written history (such as articles and books), oral narration, photography, film, music, theater, and painting. Why are these concepts important to the Palestinian people? To answer, four Al-Shabaka policy analysts – Tamara Ben-Halim, Jamil Hilal, Refqa Abu-Remaileh, and Samar Batrawi – provided reflections and arguments that have been woven into this commentary by policy circle facilitator Amjad Iraqi. They discussed the key elements that make up a narrative and discourse, and discussed how to channel them into strategic tools for the Palestinian struggle. They concluded with several questions for Palestinian analysts, historians, and artists to consider in future work. Do we need a unified narrative? Questions are sometimes raised as to why extensive time and energy should be invested in examining and further developing the Palestinian narrative and discourse. Some Palestinians argue that it is not “our job” to have to convince others, including the West, of the plight of Palestinians, and that our efforts are better channeled elsewhere. However, we would argue that clarifying these concepts plays a fundamental role in sharpening our thinking and analysis of the Palestinian struggle for freedom, self-determination, and the right of return. In policy terms, an effective narrative determines how “mainstream” audiences, including influencers and political actors, perceive and comprehend the Palestinian “story” –experiences, historical moments, and current events. An effective discourse determines the “language” or lens through which this narrative is discussed by mainstream audiences – such as through nationalist, feminist, legalist, or other bases of dialogue and understanding. Arguably, the Palestinian narrative and discourse have not yet achieved their strategic potential. Like the Palestinian people, the Palestinian narrative suffers greatly from its fragmentation. This partly derives from the differences in Palestinians’ experiences of oppression (e.g. refugees in exile versus second-class citizens in Israel); political ideologies (e.g. nationalism versus Islamism); and urgent priorities (e.g. end of the 1967 occupation versus return to the 1948 lands). It also partly derives from debates over which contemporary framework of analysis should be prioritized for diagnosing the Palestinian predicament (e.g. “settler colonialism” or “apartheid”) and for prescribing the way forward (e.g. “statehood” or “equal citizenship”). As Nadia Hijab and Ingrid Jaradat Gassner observed in an Al-Shabaka commentary, this lack of consensus among Palestinians over how to frame their collective struggle “prevents the adoption of clear messages to articulate both what has befallen the Palestinians and what we aspire to,” and in turn “obstructs the development of effective strategies for achieving these aspirations.” As such, the difference between having a unified narrative and discourse, and not having one at all, is the difference between the success and failure of the Palestinian struggle itself. We therefore suggest that Palestinians require an effective strategy that mobilizes a range of resources in order to consolidate, articulate, and amplify their national narrative and discourse on a global scale. By enhancing these tools, Palestinians can better influence mass public opinion in favor of the Palestinian cause, which over time can push powerful actors such as governments and corporations to change their policies in support of Palestinian rights. 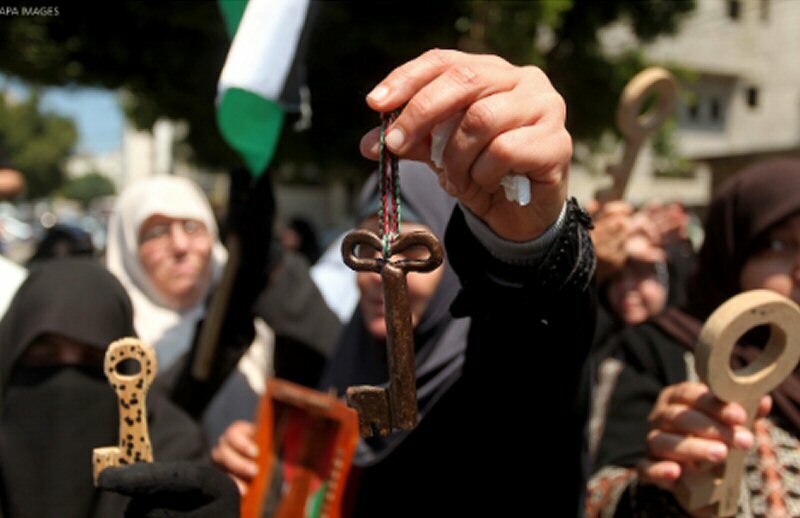 Furthermore, by unifying our narrative and discourse in this way, Palestinians can build on and contribute to the struggles of other oppressed people in the world by offering a model for how such an approach can serve their liberation. To understand the significance of narrative building, Palestinians should look to the lessons of other social and political movements in recent history. One principal example is the global struggle against apartheid South Africa from 1948 to 1994. Anti-apartheid groups promoted many differing (and oftentimes competing) ideologies and discourses: the African National Congress’ (ANC) focus on non-racialism, the Black Consciousness Movement’s emphasis on Black power, the Communist Party’s attention to economic class, and so on. However, most groups generally agreed on a common “story” of their struggle: that apartheid, as a philosophy and as a regime, was a morally unacceptable project that had to be completely dismantled and replaced, at the very least, by a democratic system with equal political rights for all races. International grassroots movements that supported the anti-apartheid struggle helped to amplify its powerful political message, including in Western centers of power. Over the years, longtime allies of the South African regime like the US and UK gradually shifted their policies to oppose apartheid. The “Comprehensive Anti-Apartheid Act,” passed by the US Congress in October 1986 – and which overrode a veto by President Ronald Reagan – imposed a range of sanctions on South Africa and conditioned their removal on the country’s “respect [for] the principle of equal justice under the law for citizens of all races;” the release of all political prisoners including Mandela; and a timetable for the elimination of racist laws, among other demands. The lessons of struggles like South Africa’s are thus valuable for Palestinians to consider how to form a clear, united, and resonant “story” and “language” that can turn the tide against Israel’s policies and bolster Palestinians’ pursuit of liberation, self-determination, and human rights. The specific components of those frameworks are a subject for future analysis; the remainder of this commentary will address some of the key challenges faced in crystallizing the Palestinian narrative. The Palestinian narrative faces many external obstacles that hinder its ability to influence mainstream opinion and policy. It has been and continues to be subjected to crude forms of defamation, misrepresentation, and distortion – not only from those promoting the Zionist narrative, but also from local, regional, and international sources. Mainstream political and public discussions continue to primarily reflect the narratives promoted by Israel, which put the demands of its national security, rather than of Palestinian rights, at the center of the conversation. These conditions are intricately tied to the active obstruction of Palestinian political agency by Israel and the international community, thereby thwarting Palestinians’ ability to organize, articulate, and operationalize their narrative. Edward Said identified some of these obstacles in the opening chapter of The Question of Palestine (1979). One is the dismissal of the Palestinian narrative by Americans, Europeans, and Israelis as being propagated by “backwards” and “uncivilized” Arabs. Another complementing example is the securitized rhetoric of the “War on Terror” – most intensely propagated after the attacks of September 11, 2001 – which depicts Palestinians and their resistance – whether violent or non-violent – in absolute contradistinction to so-called Western civilization. More specifically, in a 2013 Al-Shabaka commentary, Jamil Hilal identified five major “misrepresentations” that afflict today’s dominant discourse on Palestine: (1) that Palestinian territorial rights are limited to only 22 percent of their historical homeland; (2) that the starting point of the Palestinian struggle is 1967, instead of 1948 or prior; (3) that the Palestinian people consists only of residents of the West Bank and Gaza Strip; (4) that the two-state solution is the Palestinians’ most legitimate and viable political future; and (5) that Palestinians can develop their society and institutions while living under military occupation. These distortions are compounded by the fact that the Zionist/Israeli narrative has adapted over time to undermine any advancement of the Palestinian narrative. For example, Palestinian Arabs first had to contend with the Zionist movement’s mythologizing of Palestine as “a land without a people for a people without a land.” When Palestinian nationalism revitalized in the 1960s – bolstered in great part by the Palestine Liberation Organization (PLO) – Israel dismissed Palestinians’ identity as a fabrication, such as when Prime Minister Golda Meir infamously claimed that “There was no such thing as Palestinians.” When the First Intifada (1987-93) further elevated the Palestinian narrative onto the global stage, Israel focused on portraying Palestinian demands for their rights as existential (and anti-Semitic) threats to the Jewish state. Due to the negative discursive conditions described above, Palestinians are often forced to focus on re-interpreting or debunking Zionist/Israeli narratives – a laborious process that distracts Palestinians from telling their narrative on their own terms (or their “permission to narrate,” à la Edward Said). Sometimes, Palestinians even find that elements of their own narrative are appropriated by Israel to portray itself as the victim, such as when Prime Minister Benjamin Netanyahu described the idea of removing Israeli settlements in the West Bank as “ethnic cleansing.” Palestinians’ interaction with mainstream discourse thus tends to be reactive and defensive, often having to define itself in relation or in response to Israel’s positions. At the same time, in unraveling the Israeli narrative’s propaganda, Palestinians must ensure that their own narrative does not fall into propaganda traps itself. This can not only create new distortions about their struggle, but also be monopolized and weaponized by their own leaders for ulterior, corrupt, and/or authoritarian goals. This pattern was witnessed to varying degrees in many post-colonial or post-imperialized countries, including Algeria, Iran, Syria, Vietnam, Venezuela, and Zimbabwe, among many others. Today, the PLO appears to be following the same path. In moving forward, an important distinction should be made between grounding the Palestinian narrative and discourse in “ideology” and grounding them in “strategy.” If ideology pushes people to advocate their beliefs in their desired way regardless of the outcome (that is, failure or success in convincing people), strategy is the pragmatic pathway that enables people to put ideologies aside in the name of finding the most effective means of achieving a desired goal or solution to a problem. The challenge, therefore, is to find the best framework that maximizes the strategic impact of a unified Palestinian narrative and discourse, without compromising heavily on core ideological principles. An additional challenge is how to transform and capitalize on the Palestinians’ fragmentation – which, despite its negative effects, also creates diversity, multi-sidedness, wide networks of influence and access, and so on – into Palestinian strength and strategy. This is particularly difficult given the lack of strong and legitimate state-like institutions to facilitate, consolidate, and sustain a narrative-building process in an organized and representative manner. Arguably, a unified discourse does not have to mean absolute consensus across all Palestinian constituencies. In fact, a framework ought to be found that can bring together and accommodate the Palestinians’ differences as well as similarities; in other words, one that includes rather than excludes its multi-faceted nature. In view of these issues, three levels of framing can guide the articulation of a strategic discourse, inspired by literature on identity framing and social movements. The first level, diagnostic framing, relates to how we identify the key causes and enablers of the Palestinian predicament. For example, what are the core problems that need to be resolved in the struggle? Who is responsible for creating them? What labels and terminologies do we use to explain them? The second level, prognostic framing, concerns the outcomes and resolutions that we are aiming to achieve. This includes outlining the strategies and tactics that are required and the obstacles and opportunities to confront while pursuing them. The third level, motivational framing, concerns how we tailor both the diagnosis and prognosis to appeal to and mobilize different audiences. Can we pursue a one-size-fits-all approach? Is it enough to promote justice according to our ideological beliefs, or should we be savvy and adaptable to different perspectives? What key components and priorities of a common narrative can be agreed upon by all Palestinian constituencies? Do Palestinians need to agree on the “end goal” of our struggle in order to build and sustain a unified narrative? How do we ensure the strategic effectiveness of our discourse without making it narrow or exclusionary? Will our discourse revert to traditional models of nationalism, or can it find new frameworks to bring together the fragmented Palestinian communities? Can our narrative prioritize what we are fighting against – Israeli settler colonialism and apartheid – while our discourse centers on a vision of what we are for – freedom, justice, and equality? Does acknowledging the right of Israel to exist (as happened in the Oslo Accords) imply the acceptance of Zionism’s narrative and discourse? How should the Palestinian narrative and discourse address the historical and contemporary rights of Jewish-Israelis in a future political vision? These are some of the questions that need to be tackled not just by Palestinians but also their allies, sharing experiences and lessons from other struggles. An Al-Shabaka policy circle is a specific methodology to engage a group of analysts in longer-term study and reflection on an issue of key importance to the Palestinian people. Al-Shabaka Member Amjad Iraqi is an advocacy coordinator at Adalah – The Legal Center for Arab Minority Rights in Israel, where he has worked since 2012. He is also a contributing editor at +972 Magazine, and has published articles in the London Review of Books and Le Monde Diplomatique, among other outlets. He serves as a consultant for several policy and human rights groups in Israel-Palestine. Amjad has an MA in Public Policy from King’s College London, and an Hon. BA in Peace and Conflict Studies from the University of Toronto.